Stem cell injections are one of the newest techniques that your NYC sports medicine doctor relies on to reduce joint pain. Stem cell therapy for pain in knees and hips use the healing properties of your own cells, taken from your bone marrow or adipose fat to rebuild your damaged joints. Stem cell therapy for arthritis is one of the most popular uses for the cutting-edge treatment. Make an appointment today in our sports injury and pain management clinic to get your pain evaluation and treatment. Meet our pain doctor Febin Melepura M.D. to get the pain relief you need in the safe, reassuring hands of the best sports pain management specialists in NYC. Stem cell therapy is a process by which your sports medicine and pain management doctor in Midtown Manhattan uses healthy cells from your own body to heal other areas of your body. Stem cell therapy for pain offers a path to living free of back pain, neck pain, and shoulder pain with very few side effects. Stem cell therapy for knees and stem cell therapy for hips are being touted as the best ways for athletes to find freedom from chronic sports-related pain. Stem cell injections have shown results in reducing pain for a number of diseases including shoulder arthritis and retinal degeneration. While there’s still much more research to be done, the potential for stem cell therapy for pain is tremendous. Stem cells are the human cells from which other cells are derived. It’s not a specialized cell like a blood, bone, or muscle cell, but it has the ability to differentiate into any of the cells in the human body. The practical aspect of this is that when you have tissue degeneration, as in a diseased state like degenerative disc disease or sports injury that caused a compression fracture, getting a whole bunch of new cells that can differentiate into whatever’s needed works to maintain and repair the tissue, restoring function without having to resort to outside influences like anesthetics and steroids. As the human body ages and cells regenerate at a slower rate, healing becomes more difficult. Stem cells have the potential to boost the healing process by flooding the affected area with lots of new cells, helping to replace or repair damaged tissue, cartilage and bone. The stem cells are derived from your own body’s adipose tissue or bone marrow. Depending on the therapy you need, the procedure can take as little as three hours or be spread out over a few weeks. The first step involves removing the stem cells from your body. A minor procedure is performed under local anesthesia to remove the stem cells from your bone marrow or fat. The stem cells are processed in a closed system and returned to your body, often on the same day. Stem cells are isolated and reinjected into the area of damage, using imaging techniques like real-time fluoroscopy or musculoskeletal ultrasound. If it’s stem cell therapy for hips, hands, ankles or knees, for example, injections go directly into the joints. You should be able to go home immediately after the procedure. If there are any initial adverse reactions, your doctor may ask you to stay. But there shouldn’t be more than mild discomfort. Tell your Manhattan doctor if you have ongoing pain or swelling, or if you develop a rash or fever. The stem cells begin working immediately to complement your body’s natural healing process. Stem cell therapy for pain and stem cell injections for arthritis and natural healing after injuries may be the solution you’ve been searching for. Ask your pain management team if they’re right for you. 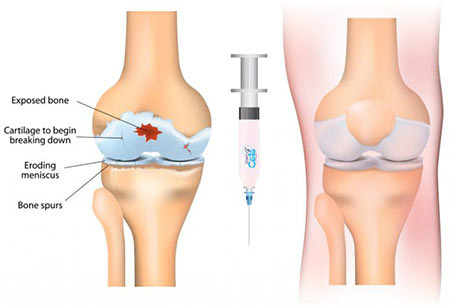 Do you have any questions about the stem cell therapy injections for pain in knees, hip we offer in NYC? 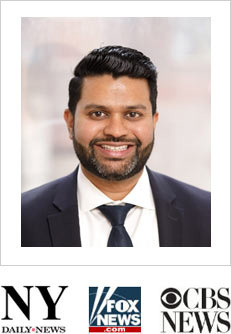 Would you like to schedule an appointment with the best rated regenerative therapy doctor Febin Melepura MD of sports pain management clinic in New York? Please contact our office for consultation with the pain relief specialist in Midtown Manhattan.